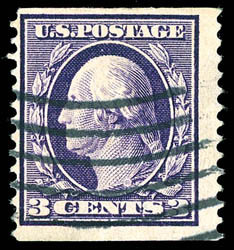 1909, 5¢ blue coil, vertical line strip of 4, o.g., top and bottom stamps h.r., center guide line pair never hinged, deep intense color and crisp impression, very fresh, Very Fine to Extremely Fine; with 2015 P.F. certificate. 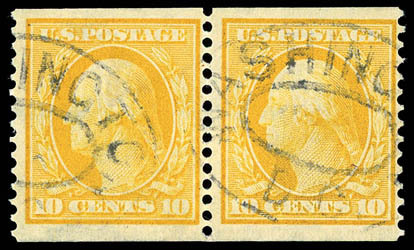 1909, 10¢ yellow coil, great rarity used, horizontal pair, light Washington D.C. oval cancels, nicely balanced top and bottom margins, rich brilliant color, F.-V.F. and attractive; with 1985 and 2009 P.F. certificates. ONE OF THE FINEST USED 1909 10¢ HORIZONTAL COIL PAIRS IN EXISTENCE. The Philatelic Foundation records contain nineteen pairs, two strips of three and a strip of four all in used condition. None of these bear a genuine used line pair and one may not exist in used condition. Furthermore, the P.F. "Certificate Search" reveals only eight genuinely used pairs have been certified, with one pair having faults. 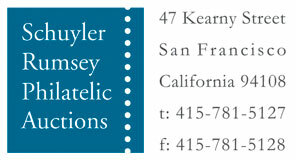 This pair and one other are finest certified examples in pair format. 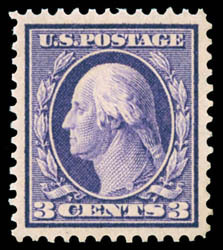 1909, 3¢ deep violet, bluish paper, o.g., lightly hinged, precision centering within large evenly balanced margins, rich bold color on fresh deeply blued paper, Superb; with 2015 P.F. certificate for block and 2015 P.S.A.G. Graded certificate (98, SSV $6,500). AN OUTSTANDING MINT GEM - EASILY ONE OF THE FINEST EXAMPLES OF THE 1909 3¢ BLUISH PAPER ISSUE. 1910, 2¢ carmine coil, vertical line strip of 4, o.g., top and bottom stamps h.r., center guide line pair never hinged, very fresh with rich bright color, Very Fine and choice, a very scarce never hinged line pair; with 2015 P.F. certificate. 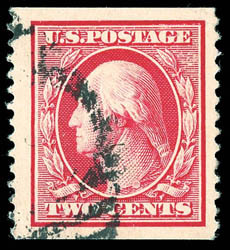 1910, 2¢ carmine coil, duplex cancel, attractively centering with large oversized margins, radiant color on bright paper, an Extremely Fine jumbo, the only used single to grade as such with none higher; with 1998 P.F. certificate, 1997 & 2009 P.S.E. certificates the latter Graded (XF 90J, SMQ $5,000 for 90). ONE OF THE FINEST USED EXAMPLES OF THE SCARCE 1910 2¢ HORIZONTAL COIL. We know of only two other used examples that surpass this, which are in a pair. 1911, 3¢ deep violet, the "Orangeburg" coil, neat wavy line machine cancel, rich deep color, centered to upper left with design well clear of perforations, Fine and attractive; with 1982 and 2001 P.F. certificates. Scott No. 389 $10,500 for the grade of fine. A HANDSOME SOUND EXAMPLE OF THE RARE 1911 3¢ "ORANGEBURG" COIL. A review of known certified examples show that the overall average centering for this issue is fine, with many poorly centered and designs cut into. This issue is also often plagued with creasing to many of the known used singles. 1910, 2¢ carmine coil, vertical line pair, neat Buffalo, N.Y. oval cancel, choice centering amid beautifully balanced coil margins, rich deep color on bright paper, Extremely Fine to Superb, one of three used line pairs to grade as such with none higher; with 2000 P.F. certificate and 2005 & 2010 P.S.E. Graded certificates (XF-Sup 95, SMQ $5,500). ONE OF THE FINEST EXAMPLES OF THE 1910 2¢ VERTICAL COIL ISSUE - REMARKABLY RARE IN SUCH CHOICE USED CONDITION.